I’m not the only member of our household that enjoys DIY projects, althought I tend to stick to the fabric-and-yarn varieties. 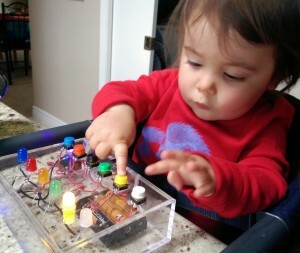 While most of us lounged around on Thanksgiving while the turkey cooked, Franci’s dad was busy making her an LED Button Box. All it took was an interest in electronics, a few basic components and very basic soldering skills. With the press of a colored button, the corresponding LED lights up and you can press more than one at a time. Not only can your toddler work on identifying colors, you can practice numbers with it as well (“press two buttons”). When she is a little older, we’ll try out sequences and see if she can repeat them.